The top United Nations envoy to the Democratic Republic of the Congo (DRC) today expressed hope that the Security Council will shortly approve a request for 3,000 additional troops to buttress blue helmets already on the ground in the country’s east, the scene of fierce recent conflict. Currently, the UN peacekeeping mission in the country, known as MONUC, has nearly 6,000 troops in North Kivu province, which has been wracked by fighting between Government forces and rebel militias. The Council’s authorization for extra forces will “enable us to reinforce our presence, particularly in North Kivu, which is really needed given the pressures on us from many direction,” Alan Doss, the Secretary-General’s Special Representative, told reporters in New York via video link from the DRC. Relief supplies are being delivered by truck to Rutshuru, north of the provincial capital Goma, and the UN is continuing with efforts to move people uprooted by conflict away from the front lines of the fighting, he said. On the political front, former Nigerian President Olusegun Obasanjo, now serving as the Secretary-General’s Special Envoy, has met with Presidents Joseph Kabila of the DRC and José Eduardo dos Santos of Angola. On Sunday, Mr. Obasanjo held talks with renegade general Laurent Nkunda, who heads the militia known as the Congress in Defence of the People (CNDP). Following their talks, the CNDP today announced that it will review the ceasefire and “pull back from certain areas,” which will become a zone of separation, Mr. Doss said. Patrolled by MONUC, this zone – running from east to west and situated some 100 kilometres due north of Goma – will serve as a “means of de-escalating the conflict and creating space between the armed groups and the national armed forces,” known as FARDC. In a related development, the UN World Food Programme (WFP) said today that it is increasing its food distributions in the war-ravaged east of the DRC in a bid to reach almost 100,000 people uprooted by fighting. The agency seeks to reach the displaced around Goma and in rebel-held areas further north. Today, WFP began distributing 20-day rations for over 56,000 people in three camps for internally displaced persons (IDPs) near Goma, with plans to deliver supplies to another three sites in the area planned shortly. Earlier this month, the agency delivered rations to the same half-dozen camps earlier this month. Also today, the delivery of much-needed food aid will begin for 25,000 displaced in Kitchanga and 11,000 in Kilolirwe, both of which are camps situated in the rebel-held Masisi region, north-west of Goma. With the security situation still shaky, food distributions are dependent on MONUC escorts. In a press release, WFP expressed its great concern for the many thousands of people it cannot reach due to the hostilities, with reports coming in of new clashes in Rwindi and Kanyabayonga, more than 100 kilometres north of Goma. But even in areas it can access, the agency stressed the difficulties humanitarian convoys face given the rainy season’s heavy downpours and poor road conditions. 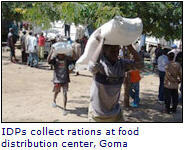 To boost its storage capacity in Goma, WFP has set up five temporary warehouses. It has also dispatched two staff members to establish a logistics hub in Beni, in the north of the province, with plans to move food there from Kampala, the capital of Uganda, within the next three days. The UN Office for the Coordination of Humanitarian Affairs (OCHA) said that the resumption of clashes between the CNDP and FARDC on 16 November in Rwindi has resulted in new population displacements, and some 25,000 IDPs have fled to the area around a MONUC base in Bambo, 80 kilometres north of Goma. Insecurity has closed most of the schools in Rutshuru, with 150,000 children – including those who forced to flee their homes – not attending classes, the UN Children’s Fund (UNICEF) reported today. A measles vaccination campaign is in progress, but is being impeded by the fighting, the agency added.